Here’s how to conquer the tough trails of Mount Trusmadi! At 2,642 metres above sea level, Mount (Gunung) Trusmadi is the second highest mountain in Malaysia. 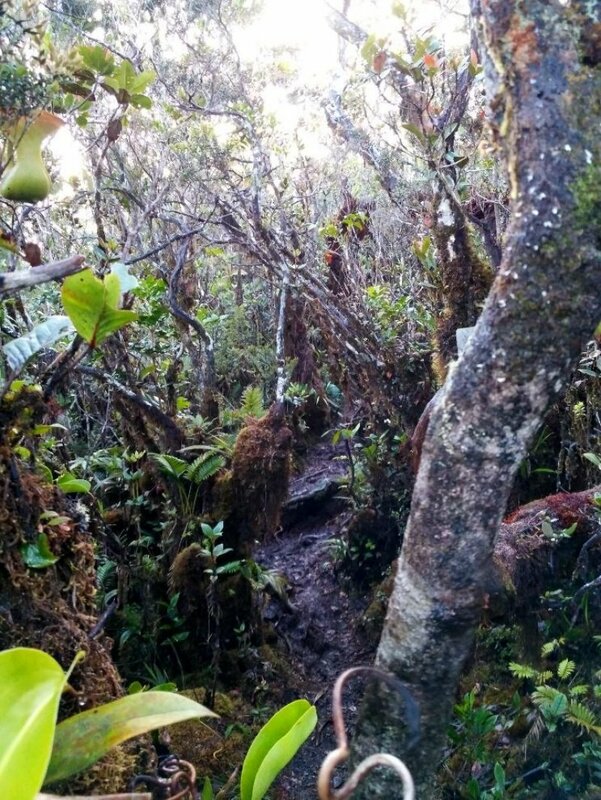 With lush forests and challenging trails, compared to Kinabalu’s rock faces and stairs, think of Mount Trusmadi as the less crowded, tougher alternative to Mount Kinabalu! I climbed Mount Trusmadi in mid-2018 and survived to bring you this guide to conquering the mountain. Mount Trusmadi is located near Keningau town, Sabah, East Malaysia. 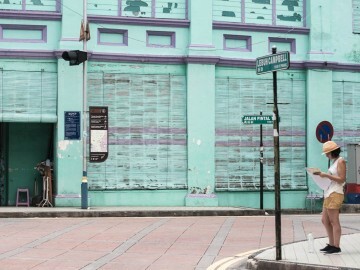 Depending on which trail you’re going on, the mountain is 2-4 hours’ drive south of the state capital, Kota Kinabalu. At the time of writing, there is unfortunately no public transportation available to each of the trailheads; you will have to arrange your own transport with your guides. There are three trails up Mount Trusmadi, each with different degrees of difficulty. Each trail is managed by a different agency. Depending on your agency’s itinerary, you can mix and match these trails to ascend and descend the mountain. The dense forest, technical terrain and fast-changing weather means that it is not advisable to attempt this trail on your own. This trail is the most developed and comfortable. 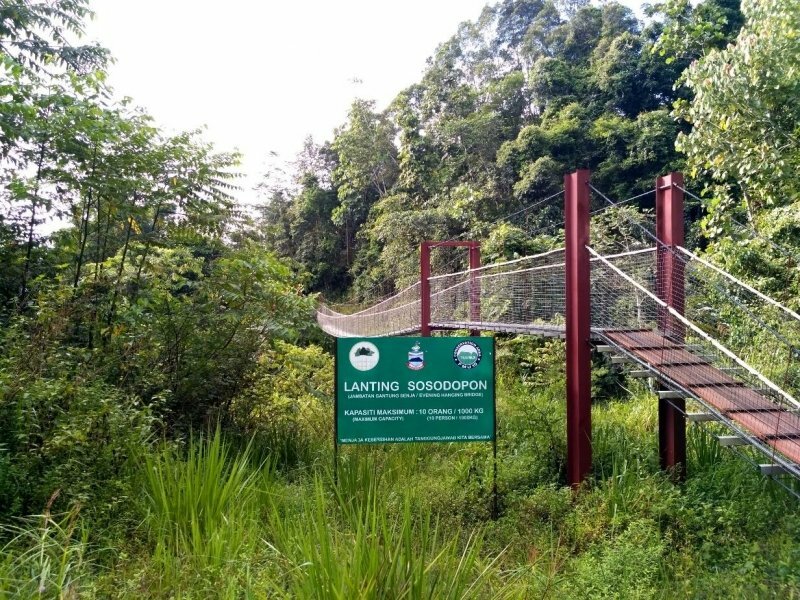 Located several hours’ drive from Tambunan, it begins easily on boardwalk for about 2km before you reach a rest house. Climbers spend the night there, before finishing the remaining 2 km to the summit. In mid-2018, this trail was not in operation as a landslide wiped out the road to Kaingaran. Check with your guides if this trail is open before you make your bookings; if not you’ll be directed to other trails. This shortest distance to the summit, but supposedly really steep, with climbers starting at 11pm the night before to make it to the summit by sunrise. 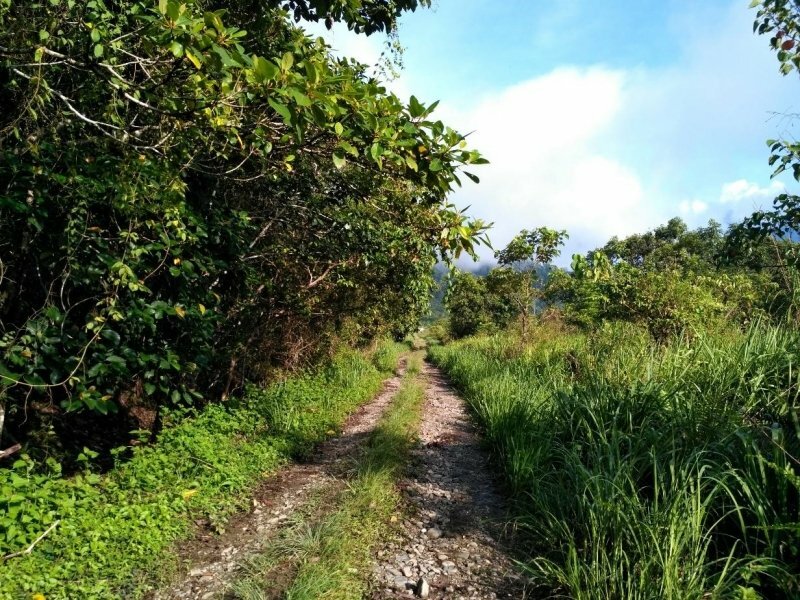 The trail is accessible by 4WD from Apin-Apin near Keningau. When I enquired about this trail, I was told by local guides who have ascended this trail that it is considered extreme. 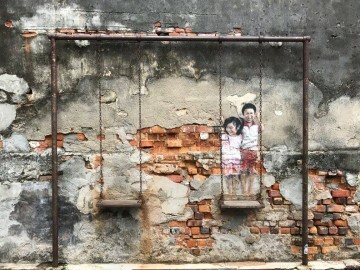 The furthest from Kota Kinabalu and the longest, the route to the summit from Kampung Sinua begins in a base camp, about 4 hours drive from the capital. From there, it’s 11.6km from the summit. This length means that the climbing packages are usually three days, two nights at minimum. Except for the last 4km, the route is quite gentle and scenic. Mr Dennis Ikon and his company Malim Gunung, administer the camps and guides on this trail. The remaining part of this post describes getting to the summit via the Mannan Trail. 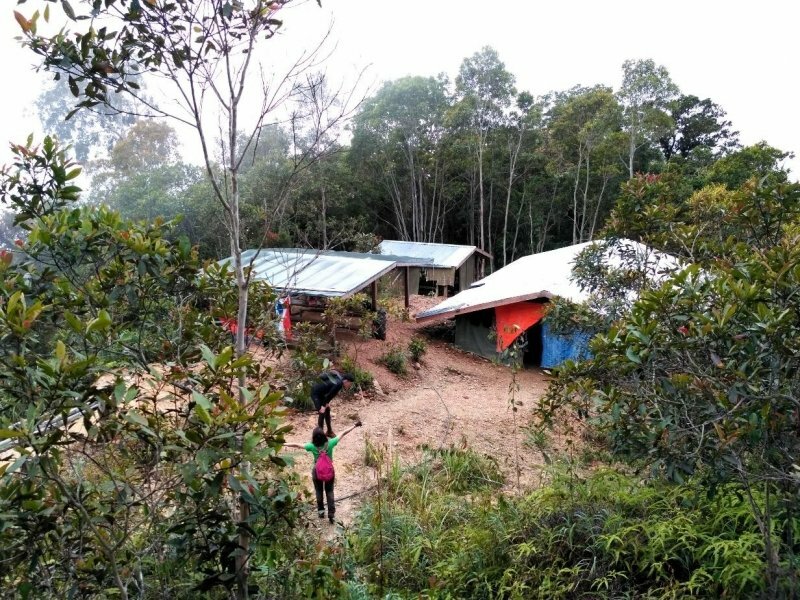 The base camp at Kampung Sinua is at the end of a dirt road. At the camp, there’s a very basic accommodation for about 30 people, a mess hall and running water. This is the last place to take a shower before heading onto the mountain. It’s swarming with mosquitos, so don’t forget the repellent! From the base camp, the trailhead starts at a slight upward gradient for 7 km. Expect a long forest trek and leeches galore. One important thing for trekkers to be aware of: there are two river crossings in the first 3 km. The first crossing can be tricky because of the current. Proceed with caution especially after a downpour. As the trail gently continues upwards, the final 800 metres approaching Camp 2 is a tricky stretch with some climbing over (and under) logs, roots and narrow ledges. This section can be even more difficult in rain. This short section is an early taste of the terrain nearer to the summit. After an entire morning spent walking, Camp 2 is a welcome respite and rest stop before the summit push. 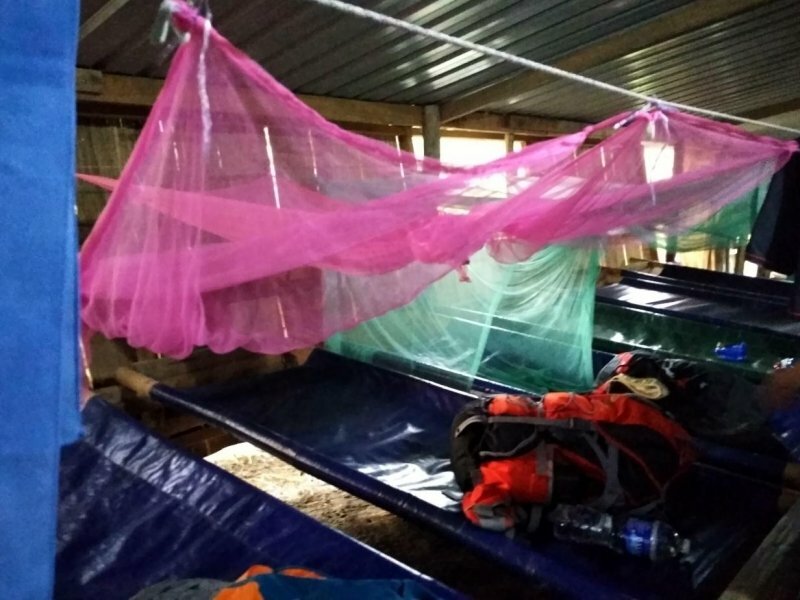 Like the Base Camp, facilities at Camp 2 – also previously known as Khiong Point – are very basic. There are two cabins with accommodation for around 30 people, a small hut that serves as a kitchen and another hut for seating and meals. A shack contains two toilets. Stored rainwater is boiled in the kitchen for drinking. The views from Camp 2 can be spectacular if there are no clouds. The summit attempt should begin at 1.30am. Take some food, visit the toilet and hit the trail behind the cabins. This will be your toughest day. The 4+ km route to the summit is not a straight upslope. The first challenge: two false summits. The second: the terrain, especially after rain, is slippery and tricky. It’s a killer combo of multiple technical sections requiring ropes, slopes covered in mud and roots, fallen trees, and rocky scrambles. As the trail climbs higher, the trees give way to pitcher plants. 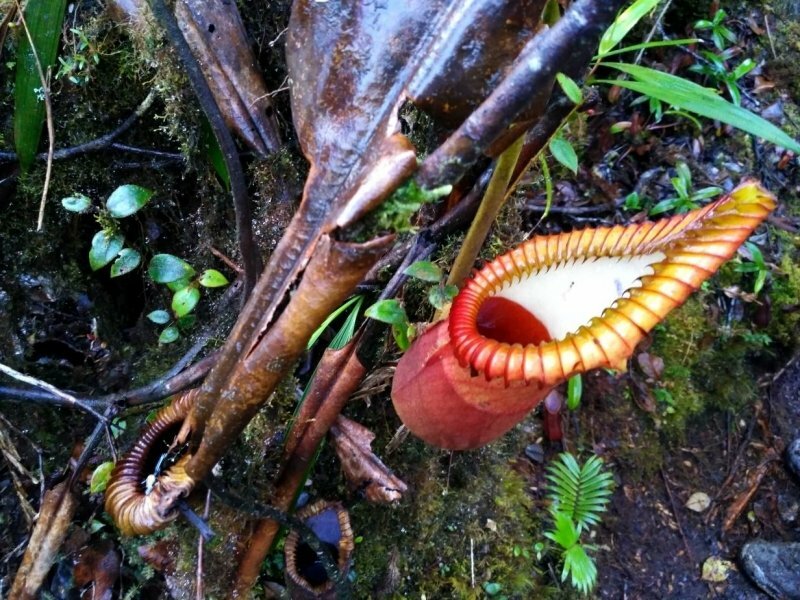 Mount Trusmadi is especially famous for the Nepenthes x Trusmadiensis, a pitcher plant found only on the mountain. 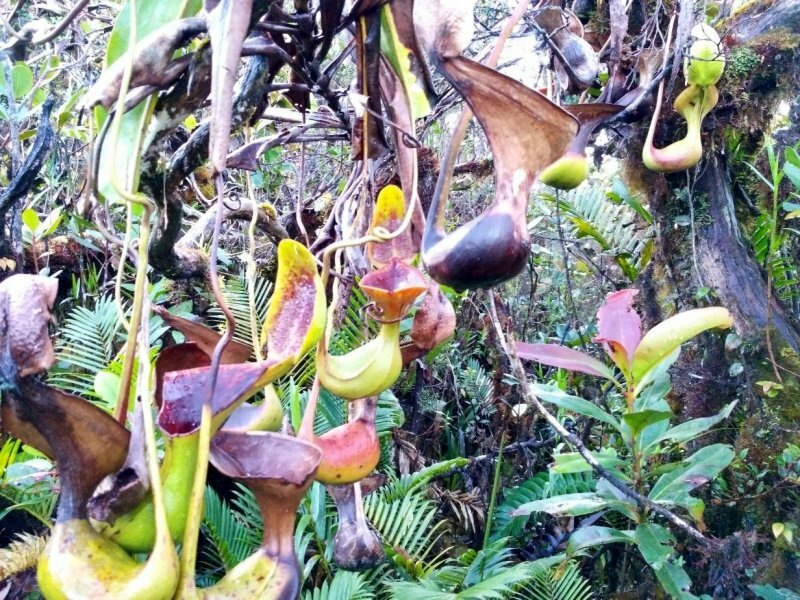 On both false summits, there are gardens of weird-looking trees and pitcher plants, especially on the second. 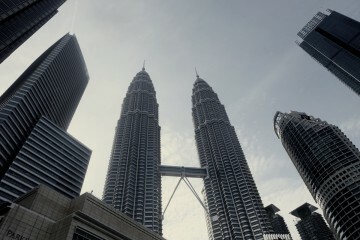 For those more interested in the view, Mount Kinabalu appears on the right, just after the second false summit. On a clear day, views are gorgeous. Sadly, three days of rain made the summit route a muddy slush that was impassable when I attempted Mount Trusmadi, and I turned back for safety. The guides are instructed to advise trekkers to turn back to Camp 2 by around 0830 hours, because the way down is much harder than climbing up. Lunch is normally served at midday at Camp 2. Any later and the cooks will not be able to make it back to the Base Camp to cater for the next round of trekkers. The return 7 km will be a hard slog, made worse by rivers swollen by rain and fatigue from attempting the summit. Anticipate a lot of swear words and regret for signing up for this torture. But, in my experience, after a cold shower and a hot meal at Base Camp later, all will be good for the long drive back to Kota Kinabalu. 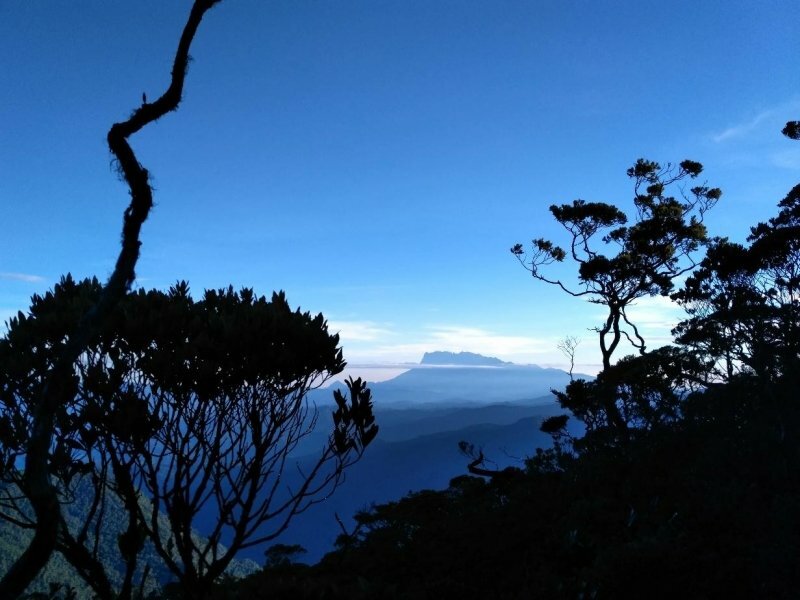 Because of its inaccessibility and the monopoly companies have over the trails, expect climbing Mount Trusmadi to be more expensive than Mount Kinabalu. My package, with food and transfers all included, set me back around 1400 RM. Pack accordingly for three days’ worth of being outdoors in a wet environment. Sleeping bag – Nights at Camp 2 fall to 10’C at night, especially when it’s raining, and the basic accommodation at the camps can be hard on the back. The guides may have extra sleeping bags, but don’t risk it. Bring your own. Water-resistant backpack cover – It will rain, and even if it doesn’t, there will be a lot of chances to get wet (condensation, river crossings, puddles). A good backpack cover is the difference between dry warm clothes at camp and a waterlogged bag. Headlamp – For the summit attempt. It will free your hands to scramble up and down Trusmadi’s slopes. Yap Xiong is a: Full-time cubicle monkey. Student of the Arabic Language. 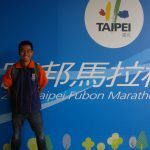 Part-time running addict. Mud-seeker at McRitchie Reservoir. Get-hands-dirty geocacher. Lover of short sentences.